Topics: Cars For Sale, and Clubs/forums. The site has about 47 users daily, viewing on average 1.30 pages each. ns2.he.net, ns3.he.net, and ns1.he.net are its DNS Nameservers. Hurricane Electric Inc (California, Fremont) is the location of the Apache/2 server. 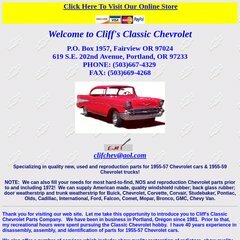 Cliffsclassicchevrolet.net's server IP number is 66.160.198.136. PING (66.160.198.136) 56(84) bytes of data. A ping to the server is timed at 41.9 ms.